This weekend, Mulian and I presented on our Grade VII Architecture project at the American Council on the Teaching of Foreign Language (ACTFL) Conference – the largest foreign language conference in the country. Check out the video of Student Reflections that Mulian made – it was a hit at the conference! * How do the form and the function of buildings interact? * How do Ancient Roman buildings and architectural elements act as storytellers? * How do they influence our 21st century story? Think about time, space, and resources: The project happens in three phases – one per term. We use MacBook Airs from the library, in the classroom/library/conference room, when available. Use Your Inspirations and Resources: I owe a huge “thank you” to so many people! Mulian provided fresh ideas and feedback throughout the year, and I was thrilled that both of our classes took on the project! We spent time thinking about how the same project can work for both a modern and classical language. The internet, especially the MinecraftEdu blogs, were critical in helping me a) to learn about a program I had never used before, and b) to understand what the students needs were. This research required the most amount of time. It took a leap of faith to teach a program that the students knew better than I. But I am a firm believer that you learn best in practicing the skills. The 7th graders themselves were incredibly flexible and enthusiastic about piloting a project with me. They watched me make mistakes constantly, and were always happy to help. 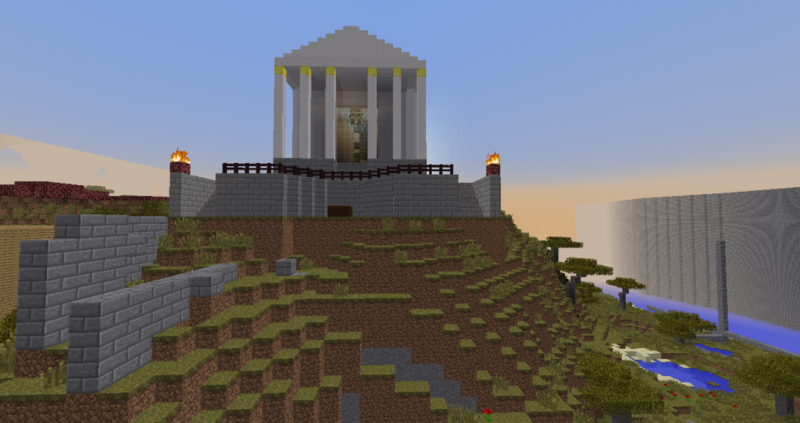 Max Ewald always talks about Minecraft, and last summer kept asking me if he could build Roman buildings in Minecraft. He provided the inspiration for the Minecraft digital reconstruction! Mulian made the excellent video (above), helping students to reflect upon the project. Last fall, Ainlsey was adamant that she “couldn’t do Minecraft.” Her aqueduct is wonderful, and she beams with pride when she talks about the project now! Ask Erika about the story of Julius Caesar – just make sure you have 20-30 minutes to hear the answer! This year’s 7th graders are already talking to the 8th graders for tips and tricks, especially those that have the same buildings. They are finding mentors in their older classmates sua sponte! The students (now 8th graders) are begging to share their work. I hope they will do a Morning Meeting soon, or perhaps share at a conference with me. I hope to incorporate more information about engineering in Ancient Rome. In other words, what tools and engineering principles were used in the building process during the 1st century AD? How are they the same or different from today? What is the impact of those similarities and differences?